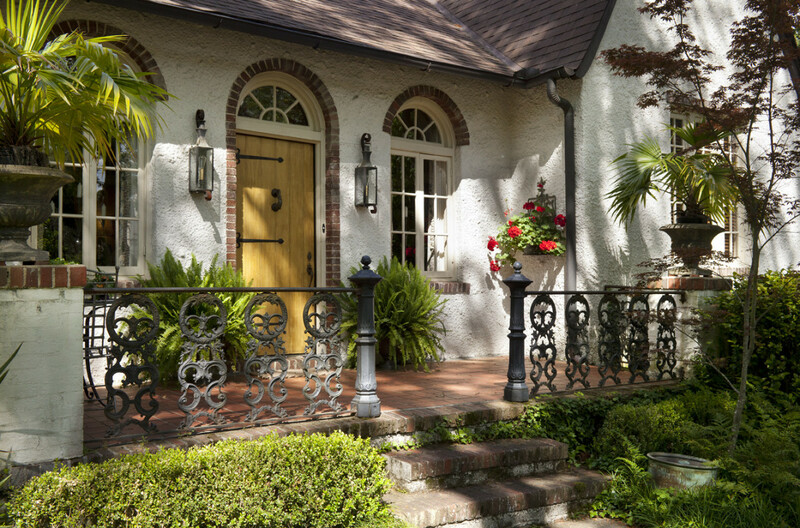 A new board-and-batten door with wrought-iron hardware was added to the stucco house. The cast-iron front porch railing is probably original. 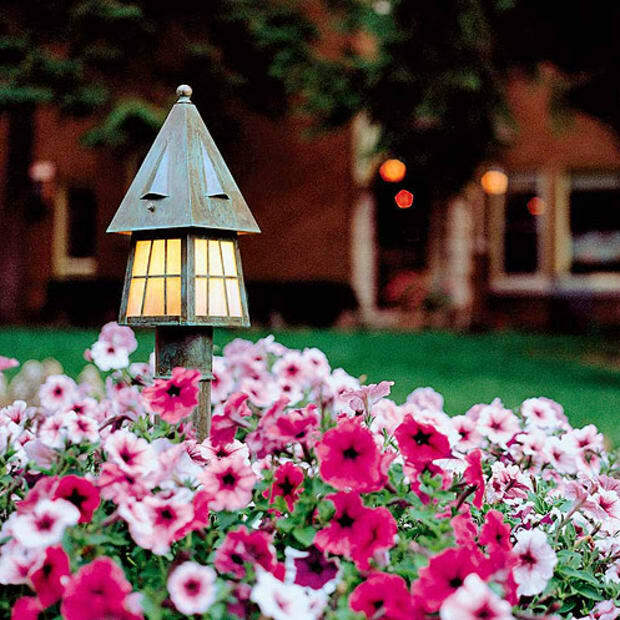 A flagstone path is lined with dianthus, also known as “ garden pinks,” an English favorite for centuries. 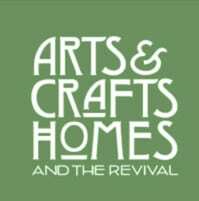 The Old Cloverdale community is a local historic district; inspired by the English Garden Cities movement, it was created as a planned garden suburb in the 1890s. 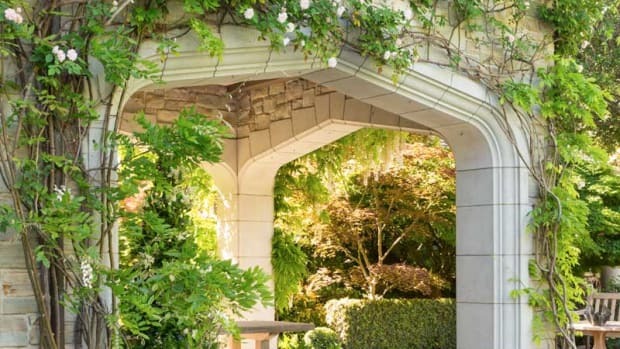 Designed by the British landscape architect and Ruskin disciple Joseph Forsyth Johnson, the place has an Old World feel, with gently curving streets lined with towering magnolia trees and old pines. Cloverdale was intended to transport residents into the world of the past—in particular, a British past—with Tudor-style houses, some with thatched roofs. Scott Fitzgerald and his wife, Zelda, whose hometown this was, lived in a Cloverdale bungalow in 1931, Scott staying only briefly before being called away to Hollywood, and Zelda remaining to write her novel Save Me the Waltz and paint ethereal watercolors of the blooms she grew in her garden. 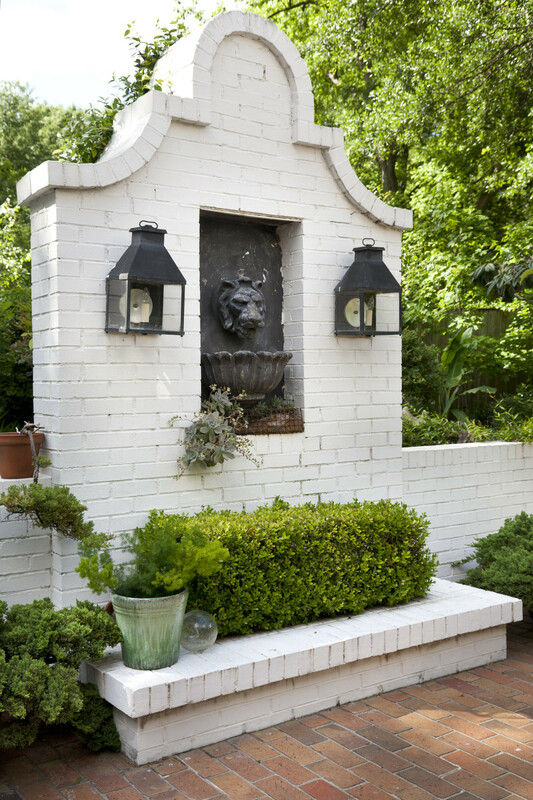 The white-painted brick wall dividing patio from driveway has a lion’s head fountain and twin black-iron lanterns. 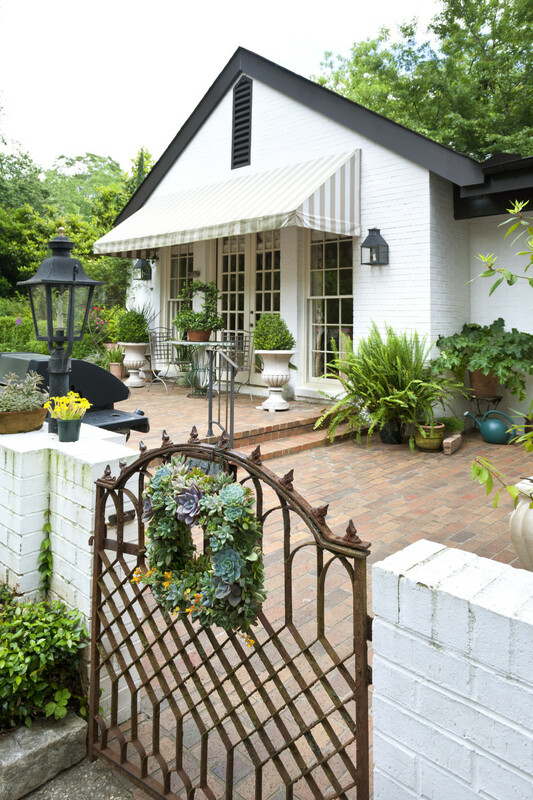 In Cloverdale, most gardens take their cue from the architectural style of the houses, creating a harmonious whole. 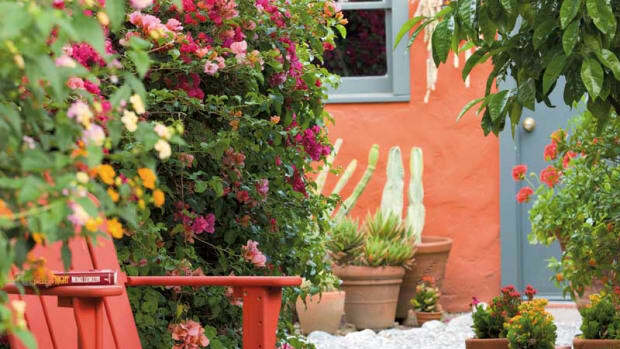 “I think that my favorite thing about my garden is that it enhances my house with the same kind of cottage-style look,” Charlotte says. But when Mark began helping her, the plot had no structure or shape; it contained just a broken fountain in an arched brick wall and three bedraggled boxwoods. 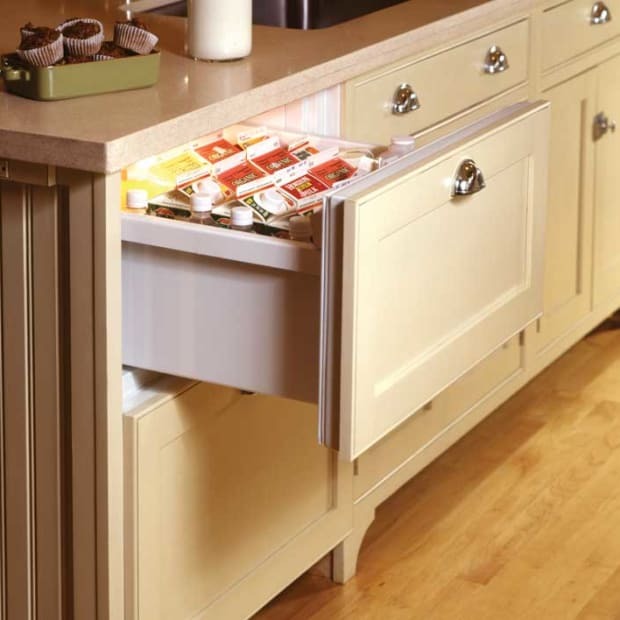 The plan he devised provided structure in the form of rough stone walls and clipped hedges of Japanese box. Purple and white foxgloves stand out against the green box hedge. With their rows of bells, foxgloves were associated with fairy music. Within these partitioned confines or “rooms,” plants in naturalistic clumps were allowed to thrive and overspill their boundaries, even go a bit wild. 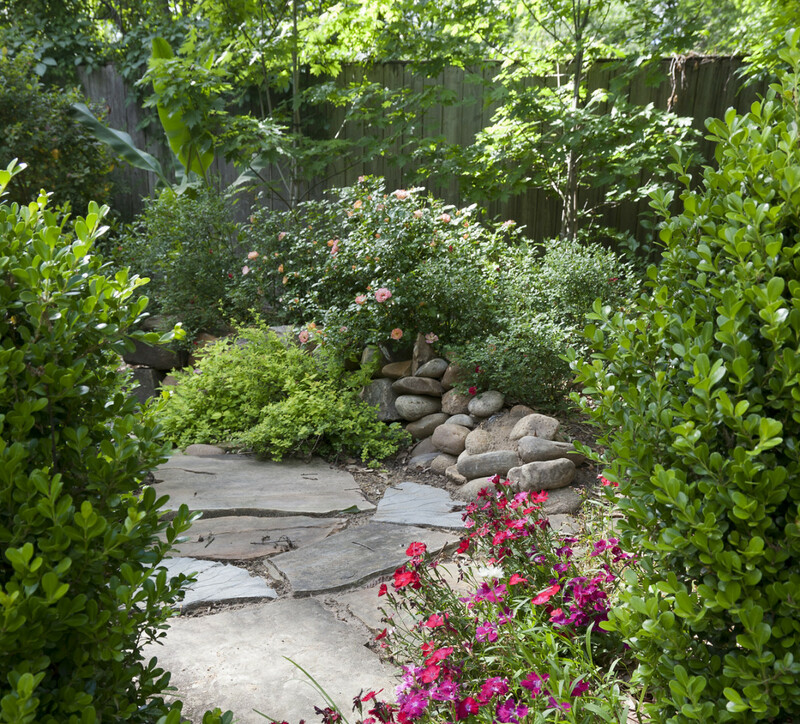 Mark left a small patch of green lawn and filled the rest of the yard with meandering stone paths and assorted flowering shrubs including that Southern favorite, azalea. Trees planted along the edges of the garden provide privacy, and include October Glory maples, Italian cypress, and Oakland holly, along with a giant magnolia. 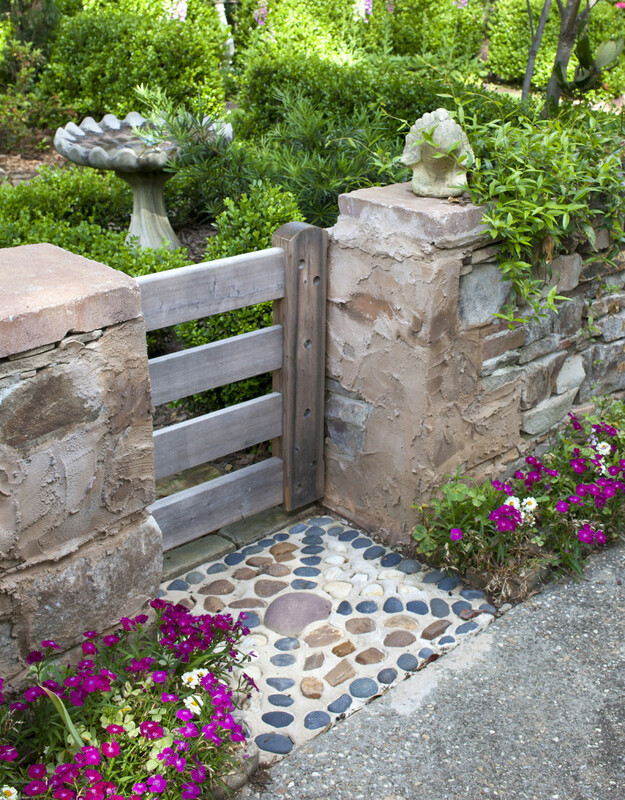 A salvaged iron gate opens to the brick patio at the rear. A striped awning shades tall windows and French doors opening to the bedroom. 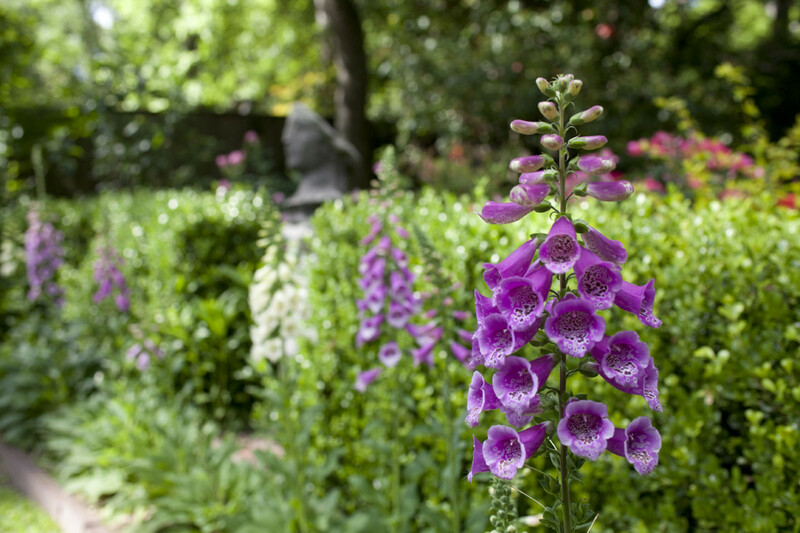 Box is the signature plant of many traditional Southern gardens; it is easy to grow in the hot climate and is a good companion plant, a backdrop for Charlotte’s colorful perennials. 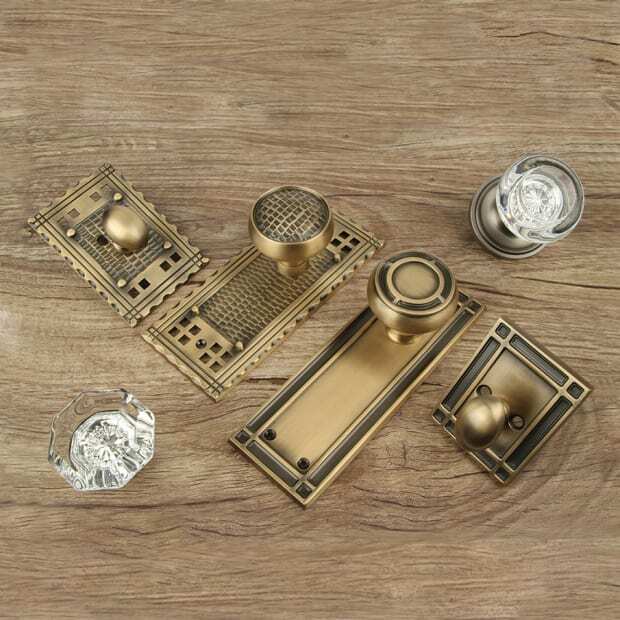 Boxwood also creates a link with the past, recalling Tudor England and the Arts & Crafts-period revival of this traditional hedging plant. Charlotte and Mark planted box topiary in urns, a practice also resurrected by the Arts & Crafts movement because it harks back to medieval times. 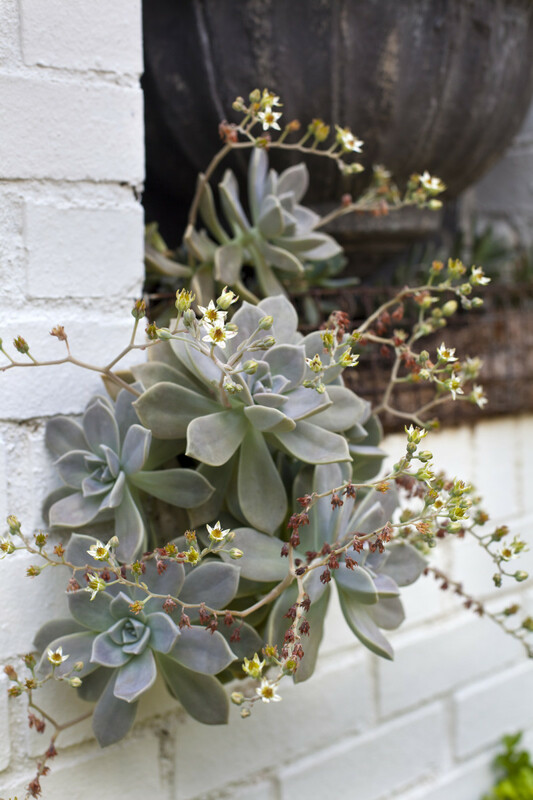 Succulents grow beneath the basin of the fountain in the arched wall. 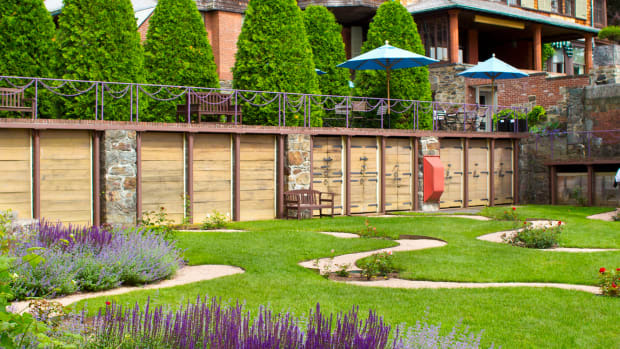 Smooth river stones were set in a decorative pattern in front of a gate made of cedar wood. Charlotte chose cottage favorites such as foxgloves, blush-pink ‘Keira’ and ‘Lady Banks’ roses, and garden pinks (dianthus), which appear in medieval books and engravings of gardens. More exotic plantings include a loquat tree, numerous succulents, and Jasminum nudiflorum (“naked flowers”), an odd shrub with waxy, bright yellow flowers appearing in the winter months. Commonly called winter jasmine and valued as one of the few plants that flower from November until March, it has been trained to climb over the rock wall. There are several Osmanthus fragrans or tea olive trees, which, with a haunting fragrance and flowers that can be infused with black tea leaves to make a scented tea, are found in many Montgomery gardens. 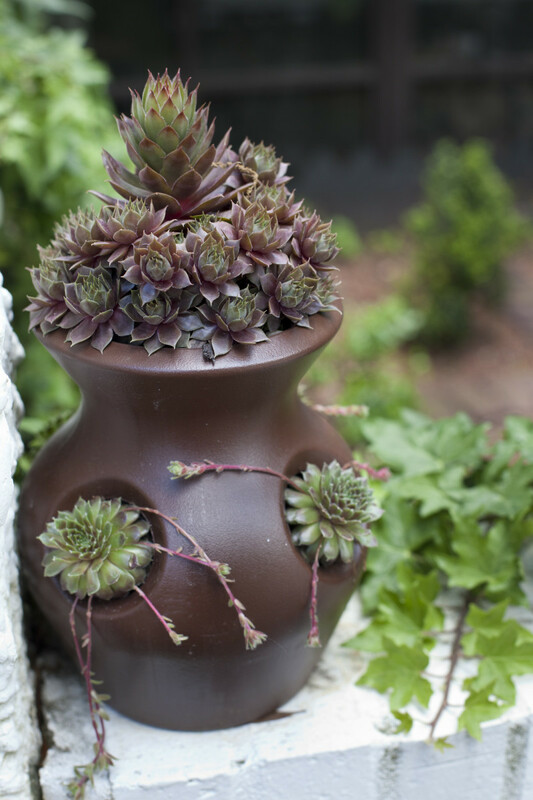 A container pot holds the succulent Montoya calls “hen and bitty,” a type that can survive the few freezes Montgomery has each winter. Several well–placed ornaments punctuate the garden: an old wooden column that Mark “drug out from under an old house,” a statuary remnant of a woman’s head, and a birdbath for a water feature. 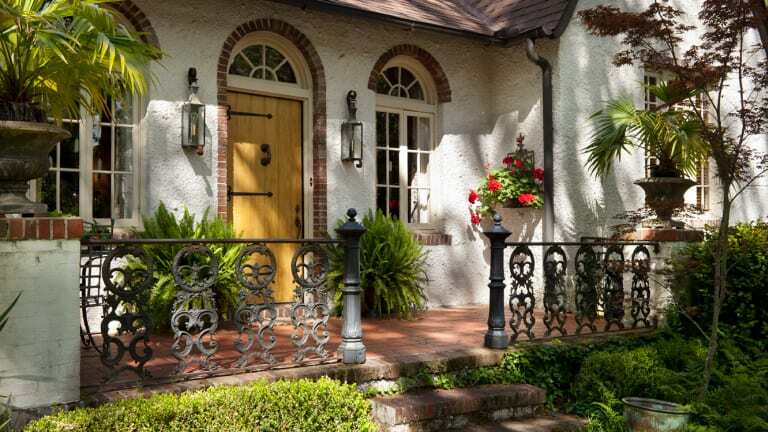 Ironwork details were carefully chosen including black lanterns, an old cast bell decorated with cherubs, and strap hinges on the front door, all blending with the original railings.